German submarine U-853 was a Type IXC/40 U-boat of Nazi Germany’s Kriegsmarine during World War II. Her keel was laid down on 21 August 1942 by DeSchiMAG AG Weser of Bremen. She was commissioned on 25 June 1943 with Kapitänleutnant Helmut Sommer in command. U-853 saw action during the Battle of the Atlantic in World War II. She conducted three patrols, sinking two ships totalling 5,783 tons. On 5 May 1945, President of Nazi Germany Karl Dönitz ordered all U-boats to cease offensive operations and return to their bases. 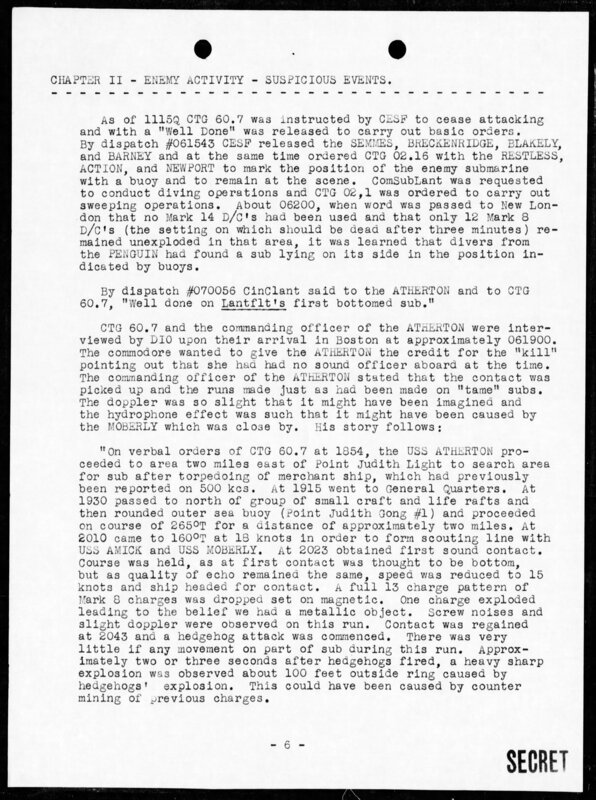 U-853 was lying in wait off Point Judith, Rhode Island at the time. 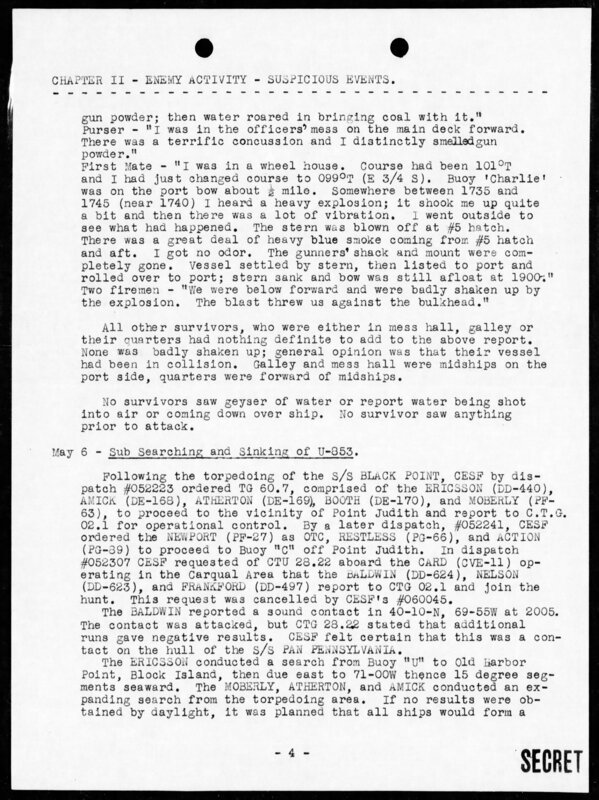 According to the US Coast Guard, U-853 did not receive that order, or less likely, ignored it. Soon after, her torpedo blew off the stern of SS Black Point, a 368-foot collier underway from New York to Boston. Within 15 minutes Black Point had sunk in 100 feet of water less than 4 miles south of Point Judith. 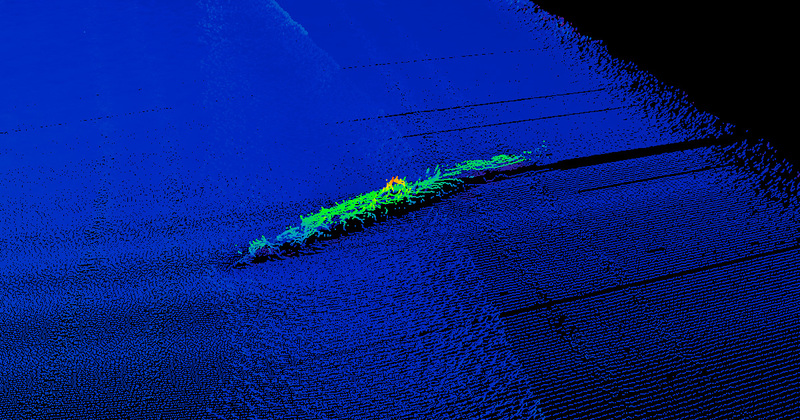 She was the last US-flagged merchant ship lost in World War II. 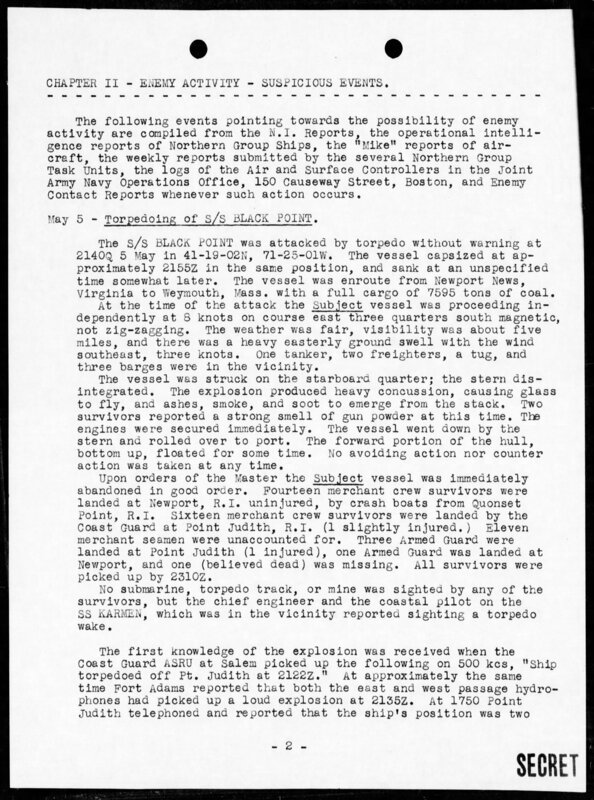 Twelve men died, while 34 crew members were rescued. 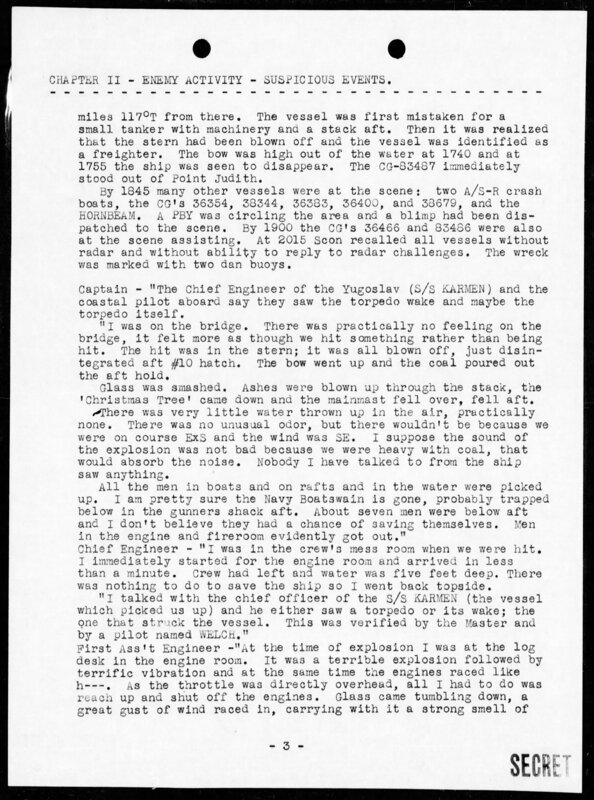 One of the rescuing ships, Yugoslav freighter SS Kamen, sent a report of the torpedoing to authorities. 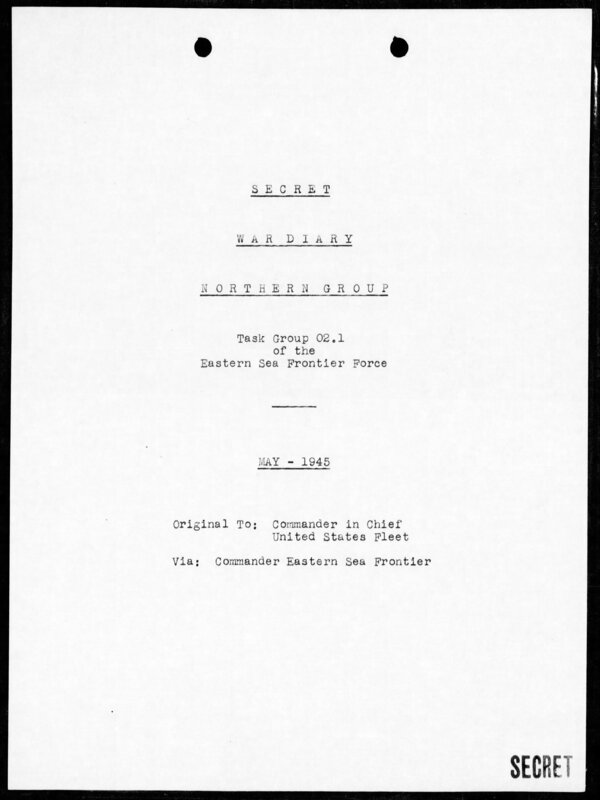 The US Navy organized a “hunter-killer” group that included four American warships: Ericsson (DD-440), Amick (DE-168), Atherton (DE-169), and Moberly (PF-63). 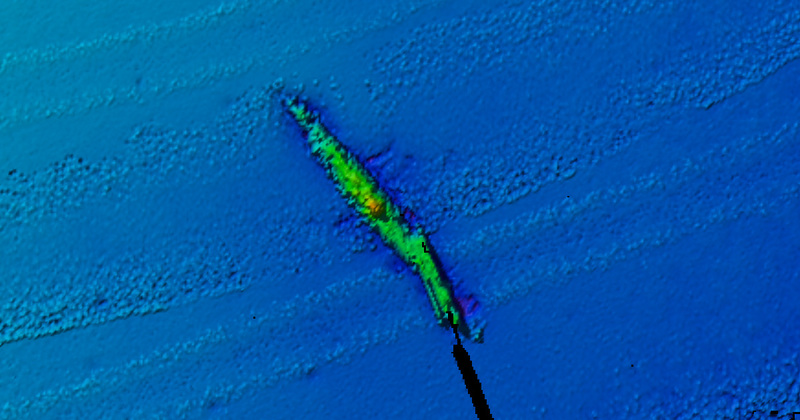 The group discovered U-853 bottomed in 18 fathoms, and dropped depth charges and hedgehogs during a 16 hour attack. 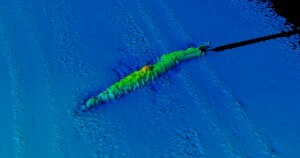 At first the U-boat attempted to flee, and then tried to hide by lying still. 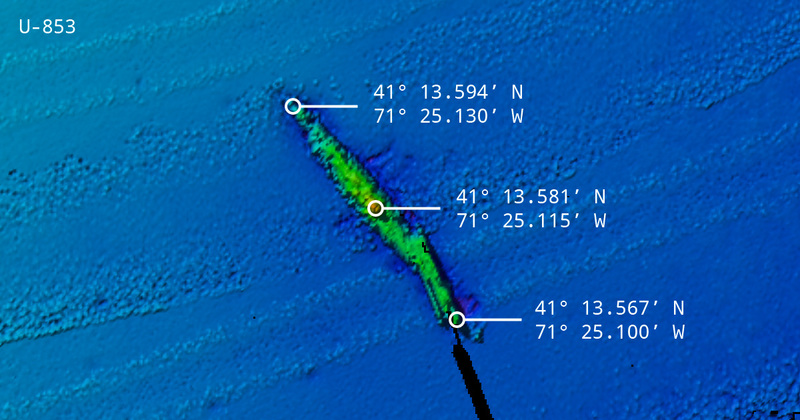 Both times it was found by sonar. 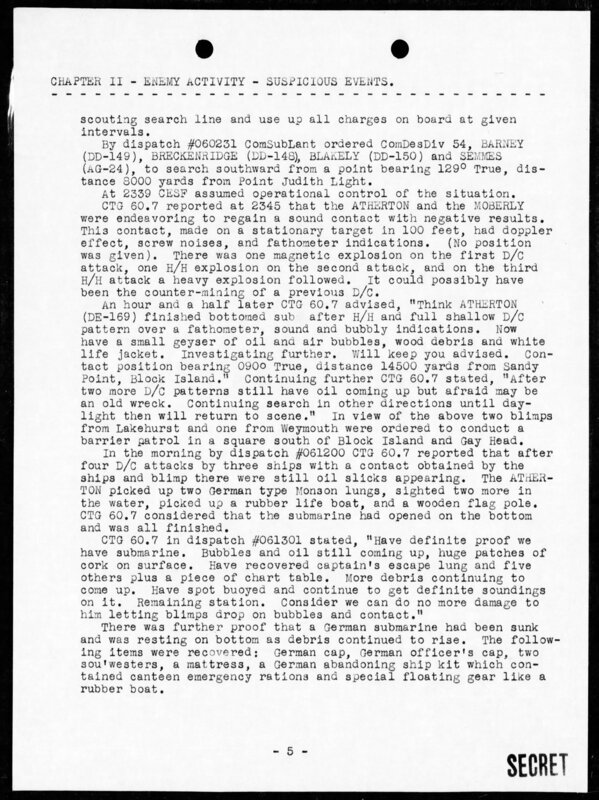 The morning of 6 May 1945 two K-Class blimps from Lakehurst, New Jersey, K-16 and K-58, joined the attack, locating oil slicks and marking suspected locations with smoke and dye markers. K-16 also attacked with 7.2-inch rocket bombs. 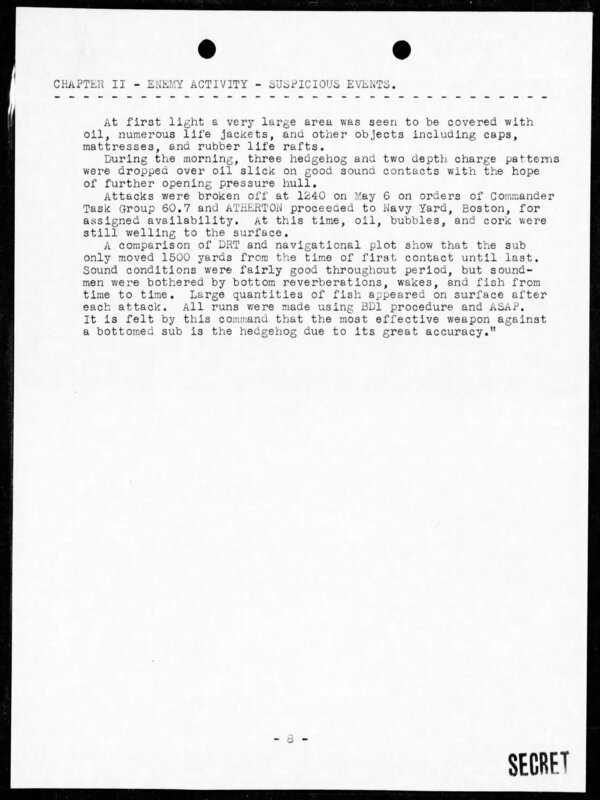 Numerous depth charge and hedgehog attacks from Atherton and Moberly resulted in planking, life rafts, a chart tabletop, clothing, and an officer’s cap floating to the surface. 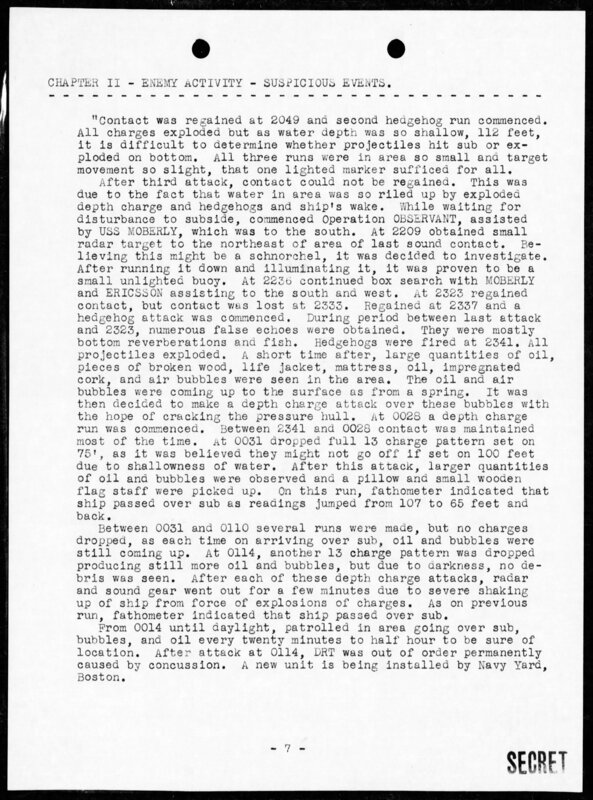 With the loss of all 55 officers and men, U-853 was one of the last U-boats sunk during World War II and, with U-881, the last to be sunk in US waters. Atherton and Moberly received credit for the kill. 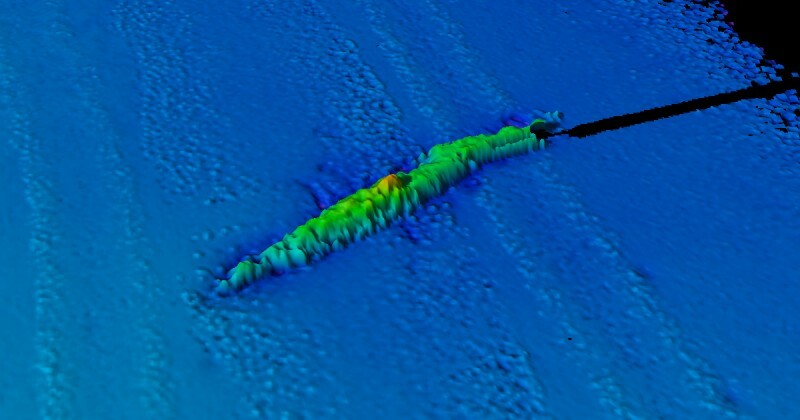 German submariner U-853 was surveyed in 2004 by NOAA Ship Thomas Jefferson. Survey ID H12009.